The chart above is from a recent Gallup Poll. It shows that christianity in the United States has suffered a sharp decline in the last few decades. In 1955, about 95% of the population claimed to be christian. By 2014-17, only about 69% claim to be christian. That's a drop of 26 points. And the drop has been mainly among protestants. Protestants have suffered a 24 point drop (from 71% to 47%), and catholics have seen a 2 point drop (from 24% to 22%). While the percentage of christians has dropped, the percentage of other religions has risen (from 4% to 11%) and the percentage of the non-religious has risen (from 1% to 20%). 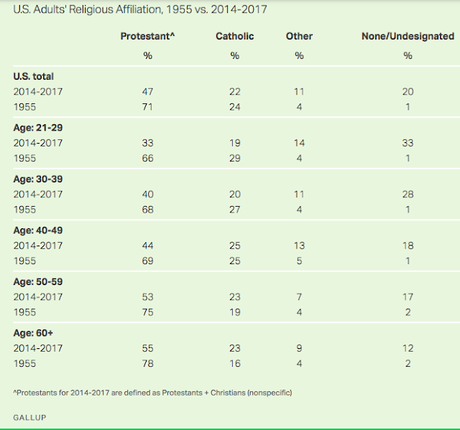 The drop in percentage of christian, and the growth of other religions and the non-religious, is true of all age groups -- but it is most pronounced among the younger age groups.